A while back it was just one of those nights when I didn’t feel like leaving the house but wasn’t sure what to make for dinner. Soup sounded comforting, so I dug through my cabinets to see what I had. Luckily, I almost always have things like curry paste, vegetable broth, and coconut milk on hand. So I did some recipe research and got inspired. I’m sure you see where this is going. 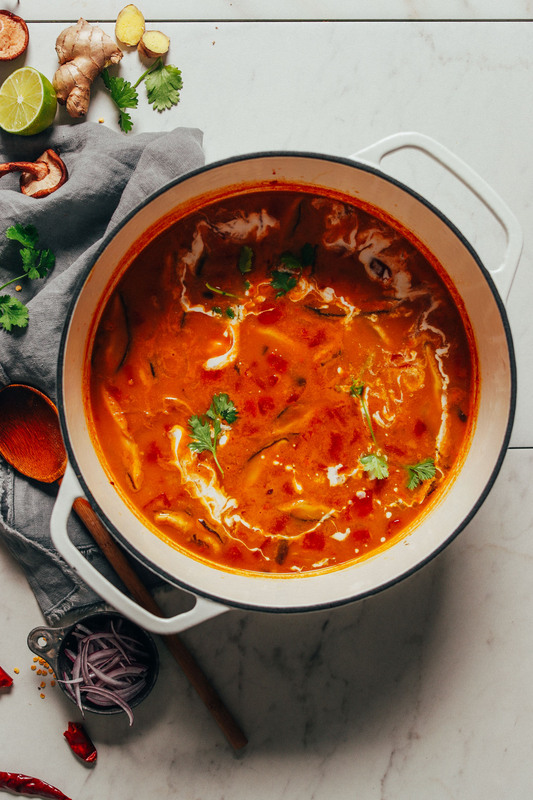 Let me show you how to make Vegan Tom Yum Soup in 1 pot with ingredients you likely have on hand right now. This recipe is inspired by the lovely folks at Evergreen Kitchen. I was swooning over the recipe but didn’t have a number of the ingredients, so I started making swaps and it turned out lovely. 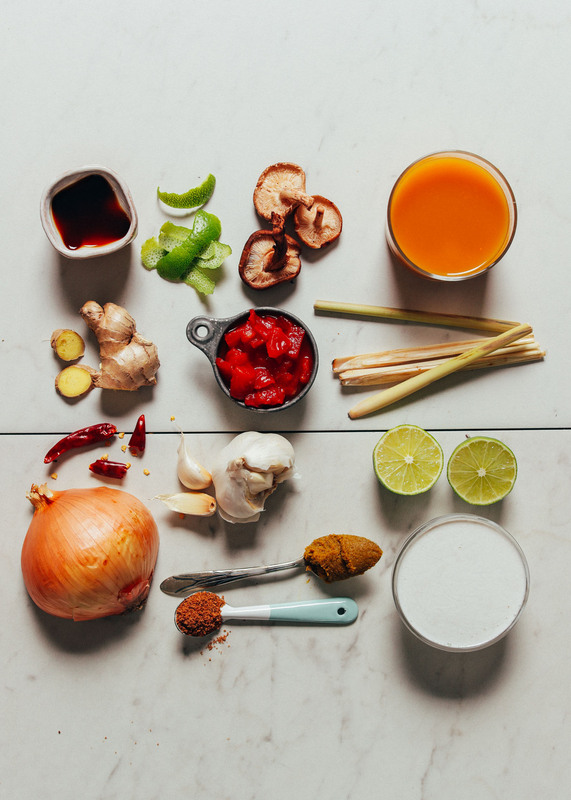 In place of traditional ingredients like kaffir lime leaves, lemongrass, galangal, fresh tomato, Thai chilies, and tamari I subbed lime peel, green curry paste, ginger, canned tomatoes, serrano pepper, and coconut aminos. Chances are most of you don’t have the more traditional items on hand either. So I thought I’d share my “lazy girl” version in the event you want soup but don’t want to make a trip to the grocery store. It starts with onion, serrano, ginger, and garlic. I also threw in some lemongrass this round, but if you don’t have it, rest assured it’s likely in your green curry paste (which you’ll add to the soup anyway)! Next comes vegetable broth, coconut milk, coconut aminos, and coconut sugar. Lime juice gets added last for that classic sour flavor Tom Yum provides. 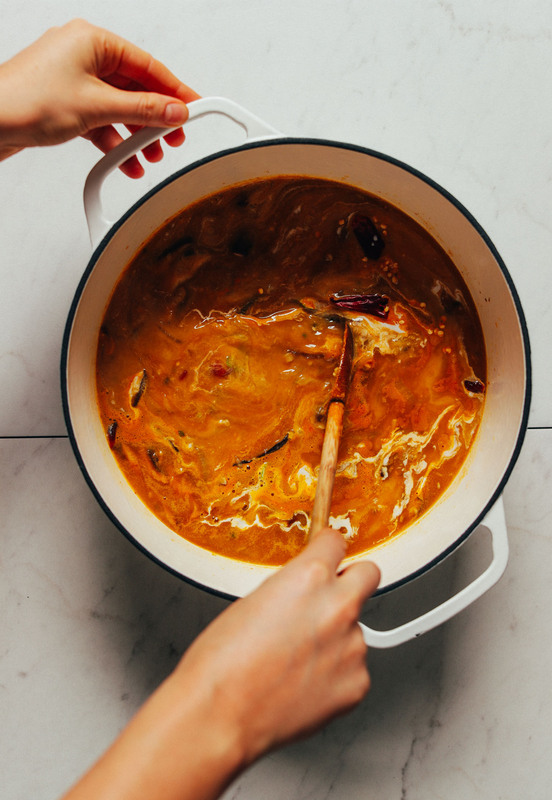 The result is a quick, creamy, hot and sour soup with a little sweetness that’s comfort food in the truest sense. Serve over cooked quinoa or brown rice noodles. Top with our Crispy Baked Peanut Tofu. Throw some plain tofu into the pot while cooking. This would make the perfect weeknight meal or side when you need something on the table fast. We enjoyed ours with Crispy Baked Peanut Tofu, zucchini noodles, and some of these Kelp Noodles! Into soup? 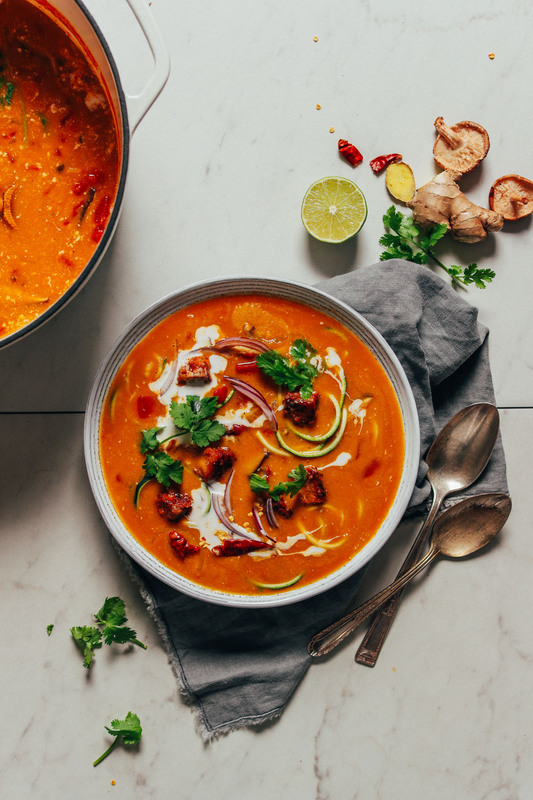 Check out our 1-Pot Vegan Minestrone Soup, Curried Golden Lentil Soup, 1-Pot Vegan Tortilla Soup, 1-Pot Everyday Lentil Soup, and Romesco Soup with Smashed Chickpeas! 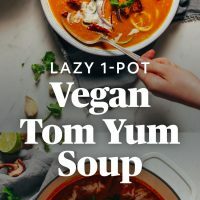 Easy, sweet and sour vegan Tom Yum Soup made entirely in 1 pot with ingredients you likely have on hand right now! Weeknight comfort with tons of flavor! Heat a large pot or dutch oven over medium heat. Once hot, add oil or water. Add lemongrass (optional) and onion and sauté for 5 minutes, stirring occasionally. The onions should become translucent and soft and slightly browned. Add fresh ginger, chili peppers, shiitake mushrooms, garlic, and curry paste (which is added to substitute for fresh kaffir lime leaf and lemongrass) and stir. Sauté for 4-5 minutes, stirring occasionally. 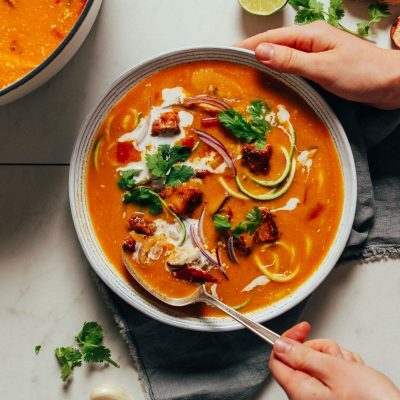 Add vegetable broth, coconut milk, a few slices of lime peel, diced (drained) tomatoes, coconut aminos, and coconut sugar and stir to combine. Bring back to a boil, then reduce heat to a simmer, cover, and cook for 10-15 minutes. Add the lime juice and stir. Simmer for a few more minutes. Then taste and adjust flavor as needed, adding more lime for acidity, coconut sugar for sweetness, coconut aminos (or salt) for saltiness / depth of flavor, or coconut milk for creaminess. 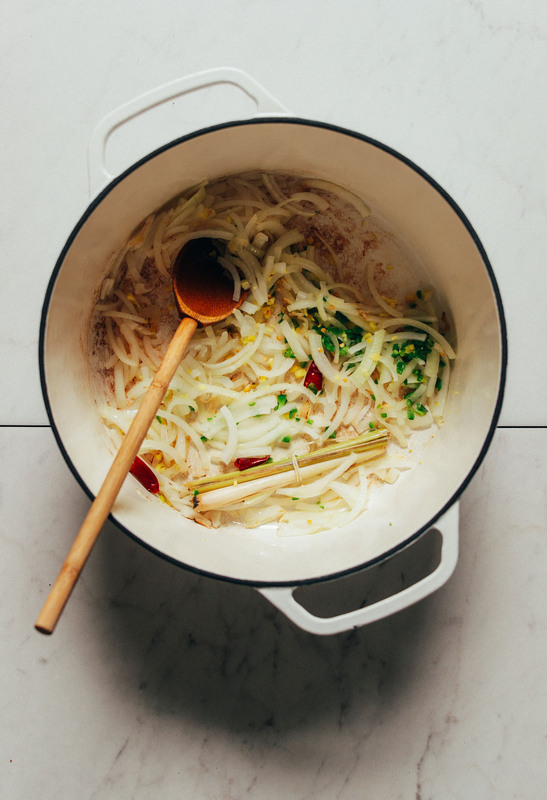 Optional: Remove lemongrass and lime peel before serving using a slotted spoon or fork (or just eat around it). Serve as is, or over zucchini noodles, kelp noodles, or cooked rice noodles. You could also serve it over white rice or brown rice. Garnish with fresh cilantro for a pop of color (optional). Store leftovers covered in the refrigerator up to 4-5 days, or in the freezer up to 1 month. Reheat on the stovetop, covered, until warmed through. *Adapted from the lovely Evergreen Kitchen! *Nutrition information is a rough estimate calculated with lesser amount of coconut aminos and coconut sugar and without optional ingredients. This soup is SO SCRUMTRALESCENT. I made it for my husband and myself tonight and it was superior to most restaurants we’ve tried. I love 🤤. Ugh. This was SO delicious! I did find the lime a bit overpowering once I ate all the veggies from the soup so I’m going to cut the juice in half (1/8 cup lime juice) next time. Other than that I made it per the recipe (went with 1 Tbsp Tamari and did go with the zucchini noodles and cilantro garnish for extra goodness) and loved it. Hi Nicole, white button mushrooms would work well! Hope that helps! This was delish! Better than most restaurant versions. Two things: how did you get your liquid to look so red? Tomato purée? Also omg that much sodium?! Hi Elena, we used Imagine brand vegetable broth which contains tomato paste, giving it a red color. Hope that helps! The sodium comes from the curry paste, vegetable broth, and coconut aminos. You can play around with low-sodium versions, if desired. Dana, were you Thai in a former life? Because you definitely nailed an authentic flavor. As good as any I ever had in a Thai restaurant and with no worries about nasty fish sauce! Made it as written—just added some lime leaves which I can get every once in a while (i freeze big quantities). Made with zoodles, garnished with cilantro, added some mung bean sprouts that needed to be used up. Such big flavors, but they all play nicely together! Aww, that’s so kind, Ellen! So glad you enjoyed this and thank you for sharing your modifications. Delicious! I forgot how good a proper Tom Yum soup tastes! It was easy and fast to make too. I’ve reduced the amount of liquid to 4 cups, but otherwise kept the same amount of spices as in the recipe. Used fresh tomatoes, added a bit of tomato paste, Sriracha sauce and let it simmer for about 25 min. I was surprised how actually fishy it tasted! I must say it looked like a weird green mess at the beginning, but when the tomatoes released their juices the soup turned into familiar Tom Yum prettiness :) Thank you! Adding this to my rotating list! I love this soup! I added plain, diced tofu for a little protein. Definitely hot and sour! Already planning on making it again this week with brown rice noodles instead of tofu! M y one question is that the mushrooms became a little robbery – perhaps it was my mushrooms. Any suggestions are appreciated because this recipe is a keeper. Is it possible that the mushrooms had water on them when added to the pan? If they aren’t fully dried, they can become rubbery when cooked. Hope that helps! Really delicious! I added a bit more coconut milk and some broccoli for extra veggies. Very satisfying flavor profile. Will definitely make again! My second attempt turned out amazing! I love that this recipe is rather quick, so when I came home super hungry, I managed to cook it in about 40 mins, including prepping the ingredients, chopping cilantro and boiling noodles. It’s a tad bit hot for me, so next time I might omit the peppers — my curry paste is pretty hot already. Aw yisss! This soup is my jam. As I’m prone to do, I added a small diced Yukon potato and a diced zucchini to bulk up my soup. I also served over rice noodles with cilantro and sriracha and a bit of toasted sesame oil. MMMMMzzz. I would have added mint and/or basil had it been on hand as well. This recipe is soul satisfying—thank you!! Shucks! Perhaps the soy sauce was either not fresh or too pungent / added too much? Hi Dana! I cooked w Jenni…for some reason, the flavors didn’t combine properly but the smell was DEFINITELY tom yum. any idea what could have happened? I subbed soy sauce too, and I had great results. Maybe there was a problem with some other ingredient. my first attempt failed because I put lime peel with pith on it (it was very bitter). Smart! Thanks for sharing, Sophia! I’m slightly obsessed with green curry flavours right now so this soup totally hit the spot for dinner + lunch. I didn’t have extra lemongrass so will definitely make this again when I do, but it was A++ even without it. I used Thai Kitchen brand green curry paste, can’t get enough of that stuff! Thanks Dana! Made this with the baked crispy tofu recipe and it was absolutely phenomenal!! Will definetly make again! Thanks, Anik! Next time would you mind leaving a rating with your review? It’s super helpful for us and others readers. xo! This recipe looks amazing! My husband and I hate diced tomatoes, is there anyway we could use a tomato paste or some other alternative? I would recommend subbing bell pepper! I recommend specifying which type of twine to use in this recipe (Cooking Twine, Butcher’s String, Baking twine, 100% cotton twine, etc.). Not all twine is food-safe, and some is even treated with kerosene! That’s a great tip, Julia! Food twine is preferred! I can make a note. Is there any way you can put together a spice list that you have? I saw the pantry section but none of your spices are listed. I’m trying to stock up so I can start cooking your recipes but I’m not sure how often you use a space or not and if it would be worth investing in a lot or a little…? Loving all these recipes! Is there a substitute I can use for coconut milk? I’m allergic but really want to make this. Thanks in advance! You can just omit it! Or sub cashew milk. haha, yay! Thanks for sharing, Kellie! Meant ground curry powder. Lol. Sorry. Curry paste is somewhat required here for the lemongrass-chili flavor. But if you try it with only curry powder, let us know! You could also use extra ginger? Good luck! Hi Dana… I’m currently transitioning to plant-based eating but am really struggling with the vast amount of recipes which include mushrooms . I am allergic to them in a big way (also any mushroom-derived ‘meat’ substitutes)! I know in some recipes they can be left out and the other ingredients increased but I was wondering if you can think of a suitable ‘substitute’ veg to use instead. So in this recipe the recipes aren’t necessary at all! Just omit and sub another veggie, like bell pepper, broccoli, or bamboo shoots! Thanks… It was more of a general question about subbing mushrooms – particularly in ‘mince’ type dishes. Heidi – if youre looking for a sub for ” mince ” type recipes why not use green or puy lentils? Thanks, Annette … I’ll give that a try. I made this tonight and it was amazing! We had the tofu on the side. Used a little less sugar in the tofu sauce but it still tasted fantastic. I found all of the ingredients (3 stores) but had to settle for dried lemon grass. Put it in a fillable tea bag and took it out before serving. Is dried lemon grass edible? Thanks so much Dana and company! My girlfriend loves it when I have a plan for dinner. Lovely! Thanks, Chris. Dried lemongrass is edible, but would probably be pretty stalky in texture. Glad you enjoyed it! Colette, you’ll find all of the ingredients above! We don’t have an “add to grocery list” feature yet but that’s something we’ll consider in the future! You are by far my super star in health food cooking!! I tried almost all your recipes, only the baked peanut tofu link seems to be broken 😖, hope that you fix it, I sincerely love you. When the recipe says ‘peeled’ lime, does that mean zested? Thank you for the clarification! Not zested but peeled – with a peeler – is preferred! Thanks for your reply, Dana! I assumed the pith should not go into the soup & peeling with a peeler makes sense. This is on my meal plan for next week. OMG yes WATCH FOR lime PITH!!! Adding coconut milk makes this a Tom Kha soup. It can be optional! I prefer it to add some creaminess. Oh wow! This looks amazing! I really need to spend more time on this site. 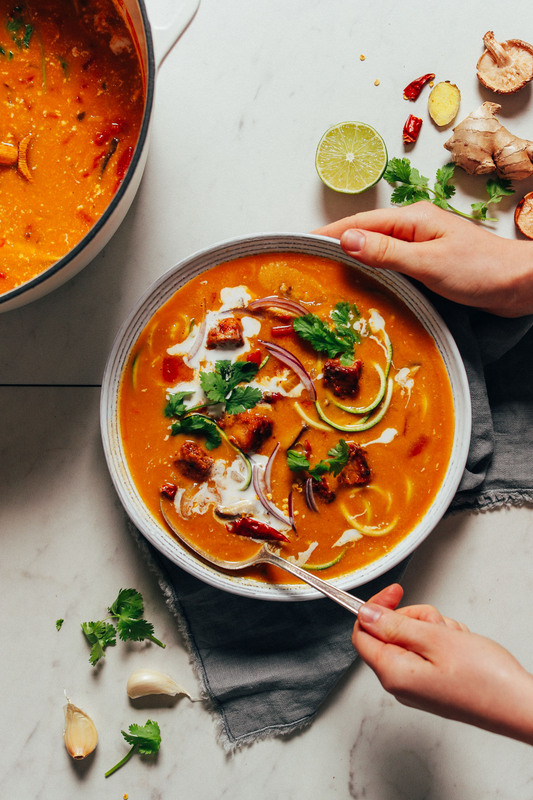 I’ve never made a recipe from here that I didn’t like, and such a great reminder that I should definitely start checking back in my weekly meal planning. I’m kicking myself right now. This soup is definitely going on the lineup. Can’t wait!!! Love Tom Yum Soup!!! Thanks, Jessica! Hope you love it. Made it tonight and yum! I got lazy with the limes and just rolled them, cut them in half short ways and squeezed. Then instead of peeling, I just tossed the 2 squeezed halves in. Worked great! Will be a dish I make again, I love how easy this recipe was and it hit the spot for that flavor I was looking for. Funny this popped up in my inbox today. Just had Thai earlier with a friend he ordered this. It looked delicious. Now I can try it at home. Thanks, Missy! Hope you love it! Looks delicious! The peanut tofu link didn’t work? Do you mind updating so that I can add to the dish! Thanks so much. Love all your food! Ah – try this one! https://minimalistbaker.com/crispy-peanut-tofu-cauliflower-rice-stir-fry/ – we’ll amend that. This looks amazing! Do you think red curry paste is an ok substitute? I have not seen green curry paste anywhere in my area! I was thinking the same thing…? That should work? Just make sure it has lemongrass OR add it to the soup as a separate ingredient. Let us know how it goes! I only had red curry and it turned out great! Thanks for sharing! Next time would you mind leaving a rating with your review? It’s super helpful for us and other readers. xo!